Just imagine how many sports bettors in America have been burning the midnight oil this week, working out their US college basketball bracket, hoping they're right about who'll make it to the Final Four and Indianapolis. 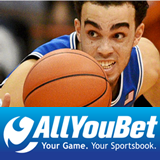 American-style online sportsbook AllYouBet will have attractive odds on all NCAAB championship games this month. If you're betting on March Madness then there are a couple of bonus offers there that you should take advantage of. Until April 7th, AllYouBet will give you an extra 50% (up to $100) when you deposit. Claim this sportsbetting bonus by entering coupon code MMBONUS15 when you deposit. Also, if you wager $1000 or more on the Final Four you'll get a $100 Free Bet on April 8th. Not surprisingly, Kentucky is the overall No. 1 seed in the Midwest. In the East, The Cavaliers ended up at No. 2. Could be quite an unpredictable bracket. On the top half of the South bracket, Duke has been labelled favourite, but the winner of a likely Sweet 16 clash between Gonzaga and Iowa State could yet have a word or two to say in the battle for the Final Four. College basketball betting has really just begun. So far Kentucky (+120) is favored to win the Championship on April 6th in Indianapolis. Wisconsin and Arizona are both +700. American-style online sportsbook has attractive odds on all NCAAB championship games.